The Heart of Lorkhan was the Stone of Red Tower[OOG 1], also known as Red Mountain. The Star-Wounded East gained its name when the heart crashed meteor-like into the Vvardenfell region in ancient times. The Dwemer Tonal Architect Lord Kagrenac constructed Kagrenac's Tools to harness the powers of the heart in order for it to serve as the Stone of an artificial Tower- Anumidum. [OOG 1] Commonly known as Numidium, the walker was the key to the Dwemeri bid for ascension, be it godhood, immortality, or something greater. The Heart of Lorkhan resided in the Heart Chamber of the Dwarven Citadel and was tapped in the apotheosis of the Tribunal and Dagoth Ur. Thereafter it was visited annually by the Tribunal in order to renew their powers. A reawakened Dagoth Ur again tried to harness its powers to construct a walking god, Akulakhan. His plans were thwarted by the Nerevarine in 3E 427. 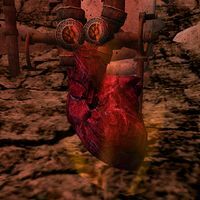 The Nerevarine used the artifacts Sunder and Keening to destroy the web of enchantments Kagrenac had placed around the Heart, which allowed mortals to draw on its power. When this was accomplished, the Heart shrank to a point and disappeared. Its fate and current provenance are unknown. Although it no longer has physical form or anchors Red Tower, its power and influence over Nirn remains, as it is in large part the spirit of Lorkhan himself. Given Lorkhan's duality theme, it may be the secret part that he hid from the Aedra during the creation of Nirn, and the sole remnant of his original daedric essence. If so, it is indestructible. Mankar Camoran alleged that Lorkhan was actually a Daedric Lord and viewed Nirn not as a world behind the veil of Oblivion, but another realm of Oblivion among the others. This would, of course, mean that Akatosh's covenant with St. Alessia was less a magnanimous blessing, and more a way for him to consolidate control over a realm which wasn't rightly his. While this theory is not beyond the realm of possibility, it is generally considered to be nothing more than an aspect of Camoran's lunacy. Esta página foi modificada pela última vez à(s) 06h38min de 6 de dezembro de 2017.